Overflowing on all 4 sides with water covering the coping… these are the secrets of the incomparable aesthetic charm of mirror pools. The ISI.MIROIR technique offers you made-to-measure elegance with no installation constraints. Designed for your comfort, all you need is a single modular element… and your pool becomes a mirror pool. It's as simple as that! Whether you're building a new pool or renovating an old one, whether your decking is wood or stone, the ISI.MIROIR technique adapts to all structures, rectangles and squares. Its level adjustment system makes installation fast and easy. 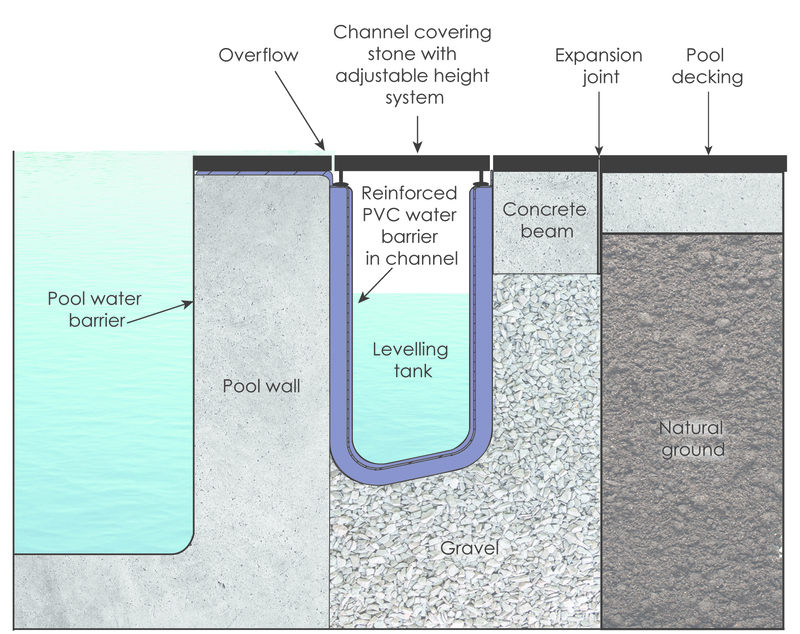 The channel and levelling system can be installed in a day by just one worker. UThis complete mirror-effect overflow system is the only one of its kind on the market. It allows you to optimise costs compared to classic installations! The amazing aesthetic charm of this type of pool is suddenly affordable. The ISI.MIROIR innovative technique is your guarantee of fast and precise pricing. Make your friends and neighbours jealous!